NBC Sports’ inaugural presentation of the IMSA WeatherTech SportsCar Championship begins Saturday, Jan. 26, 2019, with live coverage of the 57th Rolex 24 At DAYTONA from Daytona Beach, Fla., as part of more than 100 hours of IMSA programming set to air across NBC, NBCSN, NBCSports.com, and the NBC Sports app throughout the upcoming 2019 season. On April 30, 2018, NBC Sports Group and IMSA announced a new, six-year media rights agreement in which NBC Sports acquired the U.S. broadcast rights to all IMSA races beginning in 2019. 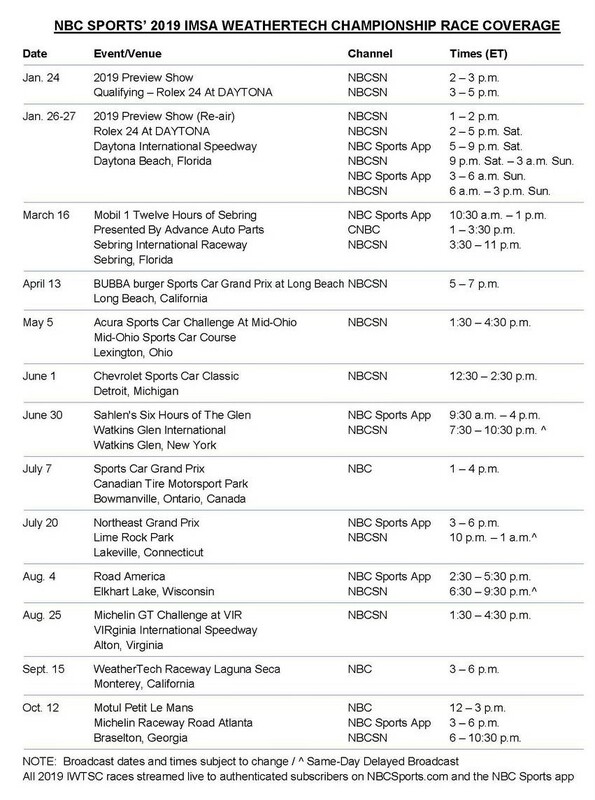 In total, NBC Sports will present three live racing windows on NBC, which will consist of coverage from Canadian Tire Motorsport Park on July 7, WeatherTech Race Laguna Seca on Sept. 15 and the season finale from Michelin Raceway Road Atlanta with the 22nd annual Motul Petit Le Mans. NBCSN is scheduled to provide fans with more than 40 hours of coverage throughout the season.